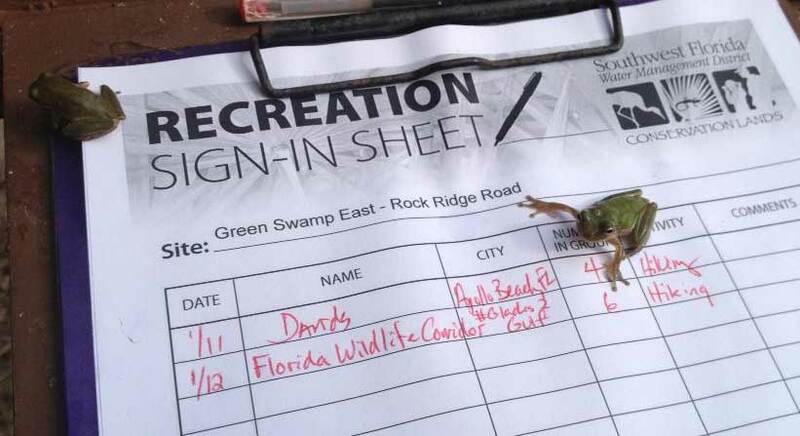 A few Squirrel Tree Frogs greeted the expedition team as they signed in at the East Tract of the Green Swamp Wilderness Preserve. Whether you are on the go or relaxing at home, there are many ways to connect with and follow the Florida Wildlife Corridor and the Expeditions. Stay informed through the links below. History and background on the Florida Wildlife Corridor, media and messages. Follow us on Twitter, and follow along at #‎KeepFLWild or #Glades2Gulf. See the natural beauty of the Florida Wildlife Corridor and search #‎KeepFLWild or #Glades2Gulf Expedition. Subscribe to our YouTube channel to experience the Corridor and the Expeditions. Read our Blog posts for more in-depth descriptions, maps, and photographs. Check in weekly with the team by listening to Florida Matters on WUSF. Sign up to receive a weekly newsletter via email. Do a Google search #‎KeepFLWild or #Glades2Gulf Expedition. Explore The Corridor and Expeditions across the webscape. Create a Google Alert for Florida Wildlife Corridor. Receive an alert in your Gmail inbox when news about the Corridor hits the web.